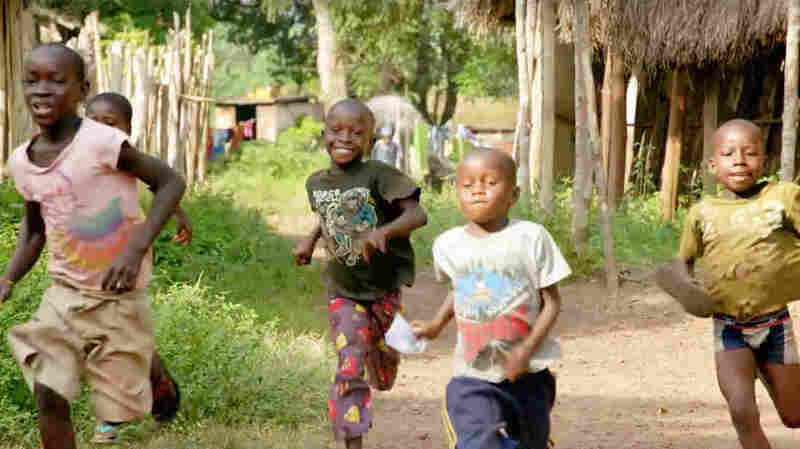 Comic Relief Hopes To Shift Away From 'White Savior' Complex In New Sport Relief Campaign : Goats and Soda We asked the experts to weigh in on the U.K. charity's new campaign that promises to put "local heroes" in the spotlight. Comic Relief Tries To Improve Its Charity Ads. How's It Doing? A screenshot from one of Comic Relief's videos from their Sport Relief campaign. The British charity Comic Relief gets a lot of flack for its celebrity-focused fund-raising ads. One of its videos, with pop star Ed Sheeran visiting a Liberian slum, was dishonored with the "worst charity ad of 2017" award from a watchdog group called Radi-Aid. They've also been criticized for portraying Africans as helpless victims, as British member of parliament David Lammy said on a March 12 BBC program. Lately, the charity is adjusting its approach. In its 2018 ads, Comic Relief says it is working to highlight local voices. "We should give the strongest possible voice to people we work with, whether those are people here in U.K., or our work in Africa, because it feels right," says Ben Maitland, head of national media for Comic Relief. But they're also not giving up on the celebrity angle. The campaign that featured the Ed Sheeran ad, for example, raised $100 million over a few months for charitable causes that the group supports — projects in the UK and abroad that tackle issues like youth homelessness and malaria treatment. The group has just wrapped up a campaign called Sport Relief, which features athletic competitions to motivate donors. As of March 24, it raised $53 million. The question is, how much have Comic Relief's videos changed? We asked for comments from people in Uganda, Nigeria, Ghana with relevant backgrounds and from the global development sphere on the new batch of fund-raising videos, which have been posted online. Points for featuring local health workers, says Jennifer Lentfer, who is communications director for the nonprofit Thousand Currents and teaches about social justice communication at the University of Vermont. But she had some criticisms, as did Carl Manlan, COO of Ecobank Foundation in Accra, Ghana. The ad seems too much like a "quick fix" approach to malaria, Lentfer and Manlan say. Although a community health worker features in the video, there's no mention of the time and money it took to train them or the investment required to build the facilities they work in. "When you look at the video, it's almost like the community and the government is absent from the picture," Manlan says, "but initial investment usually comes from the government." Since this was Comic Relief's sports-focused campaign, a few of the videos, like this one of Sipho surfing in South Africa, focus on athletics as a way to help kids. Ifeanyi Nsofor, the CEO of EpiAFRIC in Abuja, Nigeria, found himself drawn in by Sipho's story. He talks about his alcoholic dad who physically abused his mother, and copes with his situation via surfing. Nsofor likes seeing "somebody who lives through the challenges you're trying to address," he says. As Maitland said, celebrity cameos still featured in this campaign, as they will in the future. In the ad above, British TV personality Stacey Solomon travels to Uganda to talk about a family planning initiative. Given the chance to edit the video with Stacey Solomon, Lentfer would shift the narrative "beyond just Stacey Solomon asking a woman about her life and her problems," she says. She'd like to see more about Solomon "asking questions that uncover [the woman's own] ideas about the solutions." And Nsofor, whose work focuses on health care, thinks the video is a bit oversimplified: Family planning support is a small solution to a big problem, he says. Musiitwa agrees: "There's no evidence of systemic change in lifestyles that allows those women to have more choice about their reproductive rights and economic opportunities to provide for their families," she says. Lentfer thinks it's most important that Western charities portray their solutions as helpful assistance but not the only answer: "It requires a little bit of humility on our part to not be the center of the solution." In Manlan's opinion, development could eventually begin and end on the same continent. There's a growing middle class in Africa who could contribute to humanitarian programs, he says. But in campaigns like Comic Relief's, geared to a Western audience, he doesn't think Africans are seen as potential donors.